Denizens of the climate blogosphere will be familiar with Dr. Roy Spencer, who along with William D. Braswell, recently published an article titled “On the Misdiagnosis of Surface Temperature Feedbacks from Variations in Earth’s Radiant Energy Balance” in an obscure open source journal Remote Sensing. Much ado was made of it at the time in the climate denialosphere, such as this post at Forbes.com which proclaims “New NASA Data Blow Gaping Hole in Global Warming Alarmism”. But wait — what’s that I see? Turns out that the paper was stinky, as Skeptical Science points out, and as discussed at Real Climate here. Also turns out that the peer review process was inadequate, so much so that the Editor of Remote Sensing, Wolfgang Wagner, has resigned as a result. Peer-reviewed journals are a pillar of modern science. Their aim is to achieve highest scientific standards by carrying out a rigorous peer review that is, as a minimum requirement, supposed to be able to identify fundamental methodological errors or false claims. Unfortunately, as many climate researchers and engaged observers of the climate change debate pointed out in various internet discussion fora, the paper by Spencer and Braswell  that was recently published in Remote Sensing is most likely problematic in both aspects and should therefore not have been published. After having become aware of the situation, and studying the various pro and contra arguments, I agree with the critics of the paper. Therefore, I would like to take the responsibility for this editorial decision and, as a result, step down as Editor-in-Chief of the journal Remote Sensing. Wagner, who is the head of the Institute of Photogrammetry and Remote Sensing at the Vienna University of Technology, added he “would also like to personally protest against how the authors and like-minded climate sceptics have much exaggerated the paper’s conclusions in public statements”. Wagner specifically referred to headlines such as “New NASA Data Blow Gaping Hole In Global Warming Alarmism” on the Forbes magazine website and “Does NASA data show global warming lost in space?” on Foxnews.com, which both attracted considerable attention online. The paper in question – which, Wagner says, was downloaded 56,000 times within one month after its publication in July, as a result of the attention it attracted – purported to show how the Earth’s atmosphere is more efficient at releasing energy into space than is programmed into the computer models used to forecast climate change. A study published in late July made false claims and was methodologically flawed, but still managed to get published in a peer reviewed journal. The Editor-in-Chief of that journal has resigned to symbolically take responsibility for the journal’s egregious error of publishing what is essentially a fake scientific paper, and to “protest against how the authors [and others] have much exaggerated the paper’s conclusions” taking to task the University of Alabama’s press office, Forbes, Fox News and others. Barry Bickmore writers about it here. Peter Gleick writes here. Joe Romm here. Tim Lambert here. Just to refresh your memories, what was the conclusion of the Usual Suspects back in the day, such as Forbes? The study indicates far less future global warming will occur than United Nations computer models have predicted, and supports prior studies indicating increases in atmospheric carbon dioxide trap far less heat than alarmists have claimed. 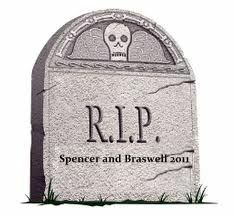 …the Spencer and Braswell is a very major contribution to the climate science debate. If, as they have shown, the models are unable to properly represent how the climate system responds to radiative imbalances on short time periods, it certainly raises serious questions on the robustness of the models in terms of their modelled physics which necessarily would result in flawed model simulations on multi-decadal time scales. I find it quite amusing and vexing how the “skeptics” bleat on about “pal review” and yet afaik, the only two journal editors who have resigned so far have been over skeptic papers. Readers will remember the Climate Research debacle and the resignation of Hans von Storch over the Soon and Baliunas paper. No, I’m not gloating. I’m not. Really. I’m saddened. This is just one more sad episode that shows where the real mockery of science and peer review resides and how the media takes poorly reviewed and errantly published denialist dreck and gives it undue traction, and ultimately adds to the noise, obscuring the very serious signal. Take a look at Peter Glieck’s page at Forbes — and look at how many people “Follow” that page. Actually it may be ‘obscure’ to climatology buffs, but it’s well-known and well-reputed (despite its young age) in the remote sensing community. I am already an author on one paper there, and proud of it! The dirty trick was precisely to choose a journal outside the field proper, in the hope to slip through a less-than-thorough review by less-than-expert reviewers, and escape the reputation effect. Usually the assumption by reviewers is, that authors are genuinely interested in getting out as good a paper as possible, in other words, that authors and reviewers are ‘on the same side’. All the known climatology journals have by now acquired the necessary cynicism re: this assumption, and are no longer useful to Spencer and friends. Of course, obscure as I used it means “relatively unknown” as opposed to “prominent” or “obvious” such as the journals that climate scientists usually publish in — ya know, Science, Geophysical Research Letters, Journal of Geophysical Research, Journal of Climate, Nature Geoscience. 🙂 Those “non-obscure” journals. No offence meant, GP. I am sure that RS is a good journal for its particular purpose. What Spencer and Braswell did was choose a journal in order to avoid the scrutiny of appropriate peers under the review of an editor knowledgable in that particular field who would give their work an undue pass, and miss big flaws. By publishing in such a venue they would still garner the cachet of peer reviewed authority without the actual peer review. Pure cynicism. Politics more than a desire for serious science was the motivator. “Wagner didn’t publish opposing views. Wagner didn’t retract Spencer’s article. Instead, he stepped down as editor and drafted a personal apology to someone not involved with the article or the journal: Kevin Trenberth. That’s also Kevin Trenberth as in the Climate Torquemada so committed to his religion he believes that the “null hypothesis” should be reversed: ie that sceptics should be forced to prove that CAGW doesn’t exist, rather than alarmists being forced to prove it does. You can’t prove a thing doesn’t exist: ergo Trenberth wants the impossible. Trenberth chairs the Global Energy and Water Cycle Experiment (GEWEX), a major funder of a Soil Moisture Network headed by Wagner. well, this just about concludes today’s lesson on the use of ad hominems, the law of unintended consequences, throwing the baby out with the bath water, painting with broad brushes, and just plain putting one’s foot in it :-). I think it is useful to note that the article at Forbes which trumpeted the publication of Spencer and Braswell’s paper was authored by James Taylor of the Heartland Institute, which has a long and disgraceful history in peddling junk science. For more info on this, see “Merchants of Doubt,” Oreskes & Conway: http://www.merchantsofdoubt.org/ . That’s how deniers do it — they’re a chorus for each other, trumpeting their dreck to the great unschooled credulous mass, who don’t know better or those who don’t want to know better. Fake journal articles, bad articles in lesser-known or non-standard journals, blog science, cherry picking, overblown pronouncements about invalid findings. It’s a bloody carnival sideshow. Snakeoil. They’re clowns. Yes, thanks for the link. I wanted to do a post on the CERN results and might still. The “damaging impact” of someone’s science? What damage is being done? I find this whole concept of someone’s science being damaging as rather scary, and it is not Spencer’s science that I find scary. Not a proud moment for the Team. Gawd…I guessed Mosher (even after I saw it was a link to Judith Curry’s blog). But then again, it doesn’t surprise me. That’s what is scary to *me*. Not a la Rush Limbaugh I trust. > My in depth thorough analyses generated relatively few hits and comments. Controversies sell well. More adversarial controversies, more comments. Is having thousands of comments per thread a good thing? > People seem most interested in any controversy surrounding high-profile personalities, discussion threads on timely and high profile topics, and essays that are critical of the IPCC. Jerry Springer. Start a fight, sit back as participants throw abuse and occasional punches, interject now and again with “pearls of wisdom”, and watch your ratings go up. Internet of lies: Vice-President Al Gore claimed that he “invented” the internet. Note the word “invented”. Josh is wrong. Although to be fair to Josh, he’s a pinhead who swallows red herrings by the barrel. Even more unforgiveably, he’s also a piss-poor artist. Not one of his cartoons looked even remotely like Al Gore. Worse still, none of his stuff is funny.